Welcome back to another week of Fantasy basketball analysis. We’re now less than three weeks away from the end of the regular season, so keep pushing for that title. This week, Matt Barnes continues to prove he can’t keep his words in check, expressing his desire to “kill” the Kings; the youth movement in Phoenix is in full swing as on Thursday the team trotted out the youngest lineup in NBA history; and we’re getting into draft season, with FSU freshman forward Jonathan Isaac declaring his eligibility for 2017. 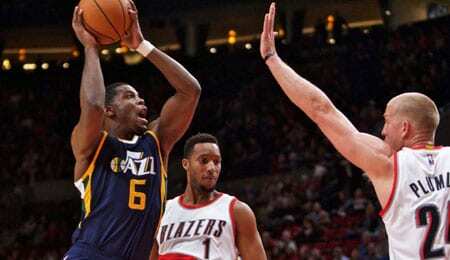 Joe Johnson, SG/SF, Utah Jazz (ESPN: 7.9 per cent; CBS: 14 per cent): No, he’s no longer the dominant player he once was, but Johnson can still occasionally string buckets together, and he sees enough PT off the Jazz bench to be a useful asset. Note that he’s currently in a shooting slump, but he remains a great FT shooter and he’s picked up the pace with his peripheral stats lately, so give him a look. JJ can still hit from downtown — way downtown (see video below). P.J. Tucker, SG/SF/PF, Toronto Raptors (ESPN: 12.7 per cent; CBS: 23 per cent): Back where it all started for him, Tucker is starting to provide nice low-level value, and the fact that he qualifies at multiple positions is a bonus. He’s been flirting with double-doubles lately, while racking up the treys and contributing plenty of steals. Willie Reed, PF, Miami Heat (ESPN: 1.5 per cent; CBS: 4 per cent): This is purely a speculative add in deeper formats or perhaps DFS play, but Reed has another chance to shine in Miami with Hassan Whiteside (ankle) beat up right now. Check the latest news on Whiteside, but look at what Reed has accomplished in limited PT of late, and then imagine what he’d do with another 10 or 12 minutes of action. Reed was really off the radar before this season, but given the opportunity, he’s played extremely well. Noah Vonleh, PF, Portland Trail Blazers (ESPN: 5.6 per cent; CBS: 6 per cent): Vonleh’s PT has really ramped up in recent weeks, especially since he moved into the starting role. His play has improved with the extra minutes, and he’s been a decent source of both points and boards, while generally putting up a really sweet FG percentage. Vonleh, the ninth overall pick in 2014, no longer looks like a bust. Justin Hamilton, Brooklyn Nets (ESPN: 0.5 per cent; CBS: 4 per cent): Looking for a speculative big man addition? Hamilton came out of nowhere Friday, pouring in a team-high 20 points and six boards in just 23 minutes. He dealt with some vision issues earlier this season, but contact lenses solved that. Now, it’s just a matter of whether he keeps getting enough PT and can retain this level of play. It’s worth grabbing him to find out. Giorgios Papagiannis, Sacramento Kings (ESPN: 1.2 per cent; CBS: 7 per cent): Papagiannis is starting to see bigger minutes, and produced a double-double last Saturday, while also contributing plenty of blocks since then. We’d like to see better FG percentages from a big, but if you’re in a deep league, he can help. This entry was posted on Saturday, March 25th, 2017 at 5:47 pm	and is filed under BASKETBALL, RotoRob, The Wire Troll. You can follow any responses to this entry through the RSS 2.0 feed. Both comments and pings are currently closed.